An aerial view of Marudi town. MARUDI: The people here are calling for Marudi district to be elevated to a division. 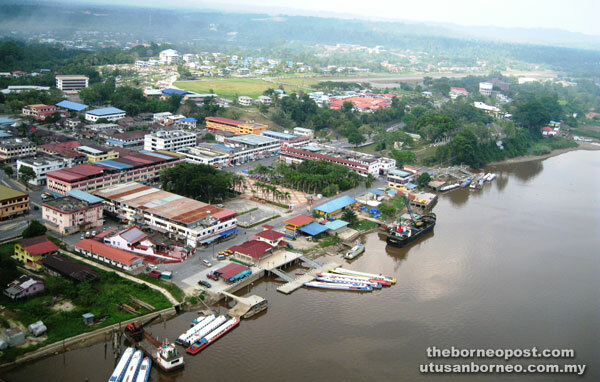 Situated on the northern bank of the mighty Baram River roughly 80km from Miri, Marudi is one of the oldest towns in Sarawak and the central trading town for the Baram district. Under the Brooke rule Marudi was the administrative centre for the then Fourth Division in northern Sarawak but later it was moved to Miri when oil was discovered there. At that time, the Fourth Division covered Baram, Sibuti and Niah areas. Edrews Abdul Gaphar, who works with Marudi assemblyman and Assistant Minister of Local Government Datu Dr Penguang Manggil, revealed that the ‘Istana’, which is now the government rest house and the grave of the White Rajah’s nephew are evidence of Marudi’s historical importance. “There are a lot of resources in Marudi so we hope this town will not be forgotten with the ongoing rapid development in Sarawak. We want the status of Marudi to be upgraded to a division,” he told the BAT 7 here yesterday. “Moreover, there’s also good potential in the agriculture sector notably rubber and pepper … Marudi district is the largest producer of rubber in the state,” he said. With all the existing amenities and facilities that Marudi district has Edrews believes that this once important administrative centre of Northern Sarawak can regain its past glory and be elevated to a division. Councillor Joseph Tiong Kee Chung agreed with Edrews on the elevation of the district into a division. He disclosed that there is already a master plan to develop Marudi and its surrounding areas including a link to the Asian Bridge in Miri and to Brunei via Ulu Linei Border. The blueprint covers the infrastructure development, agriculture activities and higher education institutions to attract more people to stay back in Marudi. “We have also plans to link up with Taiwan to develop land for agriculture through private initiative. This way, we can diversify our economy which has been focused mostly on timber which has been declining over the years and we are over dependent on oil palm,” he stressed. Meanwhile, Penguang revealed that the elected representatives from the Ulu Baram area, namely MP Anyie Ngau, Mulu assemblyman Dato Gerawat Gala, Telang Usan assemblyman Dennis Ngau, and himself have formed a team called the ‘Baram Team’ to propose the formation of new division encompassing the three areas in upper Baram; namely Mulu, Marudi and Telang Usan. “We plan that the three areas will be elevated into a division by 2019 so that there will be more funding to be allocated to this particular area of Sarawak which has the same size of the entire state of Perak,” he revealed. On his part, he has acquired the necessary funding for the riverfront plus town square, river wall along the Baram River, upgrading of Fort Hose and mini industrial estate. “The 300m proposed Baram waterfront will cost RM23 million and the river wall will cost RM17.36 million (RM8 million from Public Works Department and RM9.36 million from Drainage and Irrigation Department), mini industrial estate (RM11 million) and upgrading of Fort Hose (RM3.5 million),” he said. He added that he will propose to the government to build a bridge across Baram River, 2km away from Marudi town, to replace the ferry service. “We have also upgraded many places of worship such as the mosque (RM500,000), Muslim cemetery (RM750,000), temples and churches,” he said. Penguang pointed out that he is also gathering information and data of Beluru district’s population, number of longhouses, amenities and economic activities.